The first fossil fishes are known from scant and often ambiguous fossil remains, and research published today in Nature gives us the first clear picture of exactly what these earliest fishes were really like. The 518 million-year-old fish Metaspriggina walcotti was about 6cm long, bore a pair of large protruding eyes and small paired nasal capsules (see image, above). It breathed through seven pairs of external gills. It had a stout rod supporting its spine (notochord) enabling strong W-shaped muscle bands to develop along its entire body. Its ability to swim fast was no doubt a key factor in its success while living in precarious seas inhabited by huge predators such as Anomalocaris. Metaspriggina was first discovered and named in 1993 as it was thought then to be related to Spriggina from the Ediacaran fauna of Australia, dated at 560 million years old. The new fossils display rare soft tissue features such as stained impressions of the heart, liver, gut and circulatory vessels. The fossils came from the famous Burgess Shale sites in British Columbia, Canada, and were described by Simon Conway Morris of Cambridge University and Jean-Bernard Caron of The Royal Ontario Musuem based on more than 100 new examples. 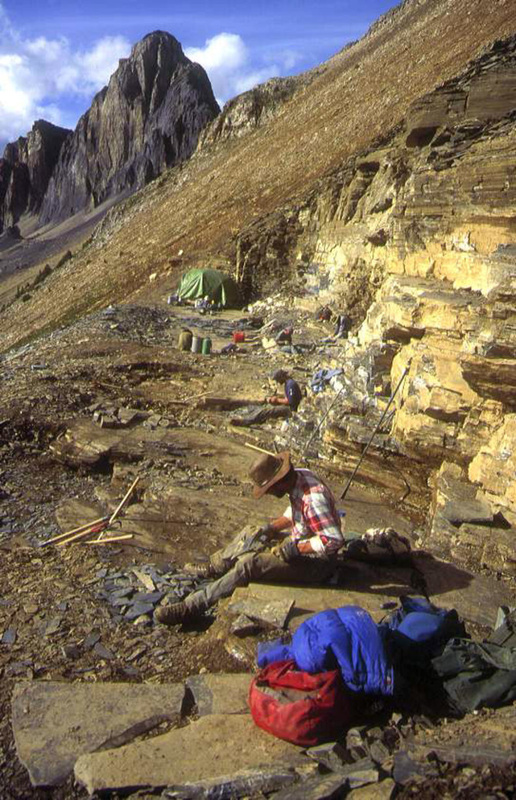 The spectacular Burgess Shale fossil site in British Columbia where the oldest fish, Metaspriggina, was found. Dr Diegio Garcia-Bellido, SA Museum. The origins of fishes have long been shrouded in mystery due to the poor preservation of fossils lacking hard bony skeletons. Other fish-like creatures such as Myllokungmingia of the same age found in southern China have doubts cast upon their vertebrate nature. But the new finds dispel doubt because they clearly show features found only in true vertebrates. This creature is therefore highly significant in being the first step on the long line of vertebrate evolution ultimately leading to us humans. The very first step of this sequence is represented by chordates, or creatures with a notochord supporting their body. These include the sea squirts (ascidians) whose larvae have a tadpole-like shape and actively swim before settling into a sedentary life, and lancelets such as Branchiostoma which are almost like fishes without fins in many regards. True vertebrates mostly have vertebrae and those with well developed heads are called craniates. The first true vertebrate such as Metaspringgina may have lacked bony vertebrae but made up for it in having a well-formed head with paired eyes and nasal sacs. More significantly it had seven pairs of well-developed gill-arches that were external as in jawed fishes, not internally positioned as in modern jawless forms such as lampreys and hagfishes. Metaspriggina is hinted at even having well formed front gill bars that presuppose the origin of jaws. Having worked on chordates from several Cambrian sites, not least on Pikaia with Jean-Bernard Caron, I think that in many ways this is the most exciting find […] because it fills a really important gap in our knowledge of early chordate evolution. Pikaia, another fish-like creature from the Burgess Shale, was long thought to be the oldest ancestor of the first fishes, as discussed by the late Stephen Jay Gould in his book Wonderful Life. Recent work by Conway-Morris has replaced it as an early fish. Instead Pikaia is now considered a protochordate, a beast one step lower on the evolutionary ladder than true fishes and more akin to the modern lancelets. The next significant stage in the evolution of fishes is the development of bone. Bone first formed in the dermis or skin and the plates are known as dermal bone. The first fish to be preserved with a dermal bone skeleton lived around 480 million years ago. Arandaspis was about 20cm long and it swam in the shallow Larapintine Sea that then spanned the entire breadth of Australia. If Metaspriggina had plates of bone enveloping its head and trunk region it would look uncannily similar to Arandaspis. A reconstruction of the early jawless fish Arandaspis, which inhabited shallow seas covering central Australia about 480 million years ago. John Long, Flinders University. The reason for studying such fossils is to piece together the stages leading to the assembly of the higher vertebrate body plan. The biggest mystery we are trying to resolve is exactly how and when the first jawed fishes evolved from these ancient jawless bony forms. The oldest jawed fishes include the armour-plated placoderms and spiny shark-like fishes. A new piece of the puzzle came to light in 2012 when tiny fish scales (1-2mm) that resemble those of modern sharks were discovered in the same geological layers where Arandaspis was found in central Australia. Named Tantalepis (meaning “tantalising scales”), they suggest that advanced jawed fishes were living in the 480 million-year-old Larapintine sea. If this hypothesis can be confirmed by finding more complete remains it would push the origin of jawed vertebrates back another 50 million years and, significantly, place the event in the eastern part of the Gondwana supercontinent. I had a rather dramatic visit to the Arandaspis fossil site back in 1993. After travelling the Gunbarrel Highway from Perth for three days, then bush bashing to the remote locality, we set up camp and then began enthusiastically collecting fossils. Suddenly, without warning, a violent thunderstorm struck us. Roaring winds destroyed our tents while we huddled inside our vehicle, sheltering from the pelting rain until the worst passed. The next day we had to get out while the track was still passable, but I’ve never been back since. Only by returning to the field and collecting the rarer, significant fossils of this age will the truth of our distant evolution finally emerge. I intend to go back and recollect from this site soon. Let’s just hope the weather is better this time round.